11001 running through Wallington Station in 1952. Photograph reproduced by arrangement with Honeywood Museum, Carshalton, courtesy of Tony Price. 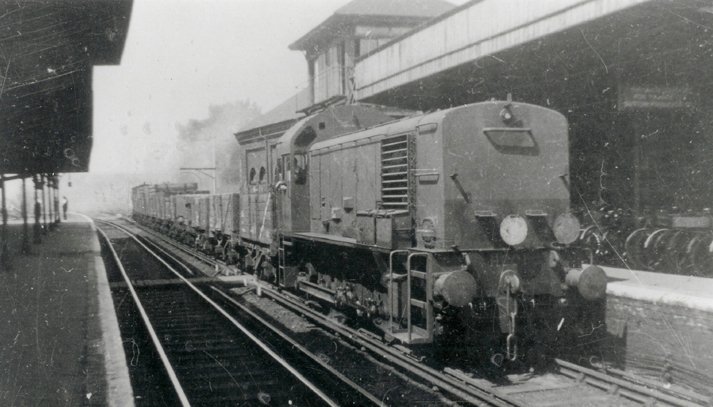 Prior to nationalisation, the Southern Railway's experimentation with diesels included Maunsell's three 350hp diesel electric shunters built at Ashford, which entered service in 1937. Bulleid's batch of 26 new Class 12 diesel electric shunters also of 350hp were already being outshopped, when a further design was tried. 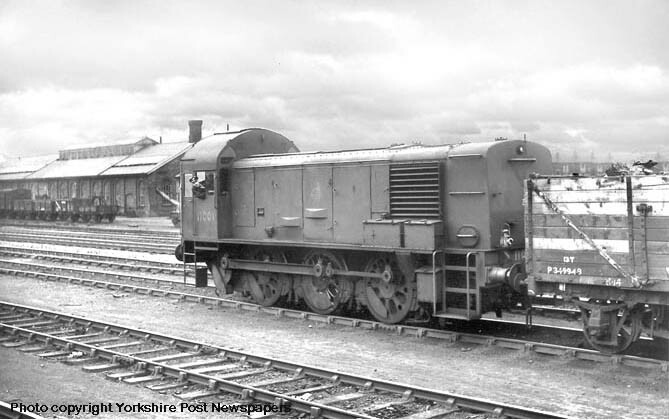 To produce a shunter that could drag pick-up freights at greater speed, 11001 incorporated a mechanical gearbox to give a 45 mph top speed. 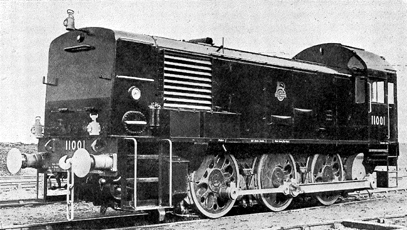 Bulleid's prototype 11001 was also designed and built at Ashford, and used the same 4' 6" Bulleid-Firth Brown type wheels as the Class 12 shunter, but was installed with a larger 12 cylinder Paxman RPH series V-type diesel engine, with a maximum of 500hp output at 1250 rpm. Drive was through a Vulcan Sinclair fluid coupling to a 'Synchro-Self-Shifting' gearbox which provided three forward and reverse gears in either high or low range. The plate sided chassis was somewhat akin to a standard tank engine, but it is curious that the drive from the rear jack crank shaft is taken to the centre axle through chunky connecting rods, resulting in massive balance weights on the centre driving wheels. Although innovative in it's own way, 11001 was not one of the more obviously Bulleid influenced designs conceived during his time as CME, though it is apparently credited as the first diesel locomotive put into service by British Railways. 11001 as introduced in B.R. black livery. A rear view of 11001 showing the very plain cab and domed roof. Note the massive connecting rod from the jack shaft to centre crank pin. Photo: courtesy of C.J.M. collection. Principle Dimensions: Height, rail to top of bonnet: 10' 9". Height, rail to top of cab vent: 12' 11½" Overall length: 33' 3"
However its body styling was unique, with a long bonnet which unusually housed the fuel tank at the front, rather than a radiator; and a very high arc cab roof with large angled front windows. The locomotive was completed in 1950 after Bulleid had departed, the same year as 10201 was outshopped. 11001 was originally finished in plain black livery, unthinkable in these days of Health & Safety legislation, but was later repainted into green. For most of it's life 11001 was based around Norwood yard. It was intended for shunting and short pick-up trips, but the locomotive was just fitted with air brakes, with no provision for train braking. The compromise meant it was was not entirely successful at either, and was gone with 10 years. Clive Young recalls mention that it suffered gearbox failure, which would agree with the 1958 photo below which shows 11001 in a forlorn state with the gearbox removed. As a variation on the standard Class 12 shunter this would make an useful yet compact model in 5 inch gauge; the casing should be big enough to fit a couple of reasonably sized batteries, enough for a few hours of shunting wagons. A fascinating picture of 11001 c.1958 at Ashford Works, probably just prior to withdrawal in 1959. Notice how the whole gearbox / jackshaft assembly has been dropped out just like an axle set. Also clearly shows the double brake shoes per wheel. Photo: Ron Fisher.